2. Add crushed garlic cloves and chopped onions and fry for 2-3 minutes. 3. Add the green chillies, sliced through the middle. 6. Add all spices as indicated above and allow the spices to blend well (Optional – add a chopped tomato for extra taste and color). Cook for about 12-15 minutes adding more water as necessary if the sauce starts to dry up too much. 9. Garnish with fresh coriander and one or two fresh green chillies and remove from heat. Cooked this using whiting, on the advise of my fishmonger. 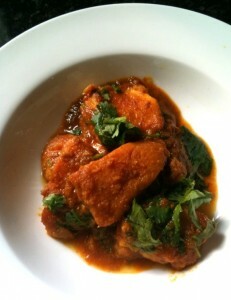 It was delicious, I’m really pleased as I have always feared cooking ‘desi style’ fish. Really glad it worked out for you! Do let me know if you experiment with any other recipes. Would love to hear your comments. Trying this for the first time using white fish……never had a fish curry in my life……eeeeek! Smells bloody good though ? Oh my goodness! Thank you wholeheartedly for this recipe! I made it tonight for dinner- and it was difficult to find the self discipline not to eat everything in the pot! My husband was so happy with this- this recipe served up some joy in our household. Thank you again- this will definately be made again- perhaps with a different varietyof fish. What a treat. Yummy! Thank you so much for your comment. It was a pleasure to read and I’m so glad this dish made you and your husband this happy! Please try some other recipes and let me know your thoughts. Thanks again. Enjoy!